Charafe Ennaji is the first openly gay belly dancer in Morocco. The Man who Danced Alone is an beautiful artistic performance written by himself and based on his life experiences. After the theatre performance Charafe Ennaji and a panel of Moroccan LGBTIQ migrants and Dutch-Moroccan LGBTIQ discuss the shifting visibility of the Moroccan LGBTIQ communities and the culture differences with the Dutch Moroccan LGBTIQ. Panel talk is co-hosted by Pink Marrakech. The man who danced alone is a production of Storytelling Centre and is directed by Arjen Barel. IQMF Amsterdam will conclude with a very special programme on the Sunday afternoon. A programme in the dark, you can close your eyes and simply listen. Six courageous people who fled their homelands and left their family in search for freedom, acceptance and love will present their stories in a mix of live storytelling and recorded audio. Queer Faces, Migrant Voices is a Stichting art. 1 production in collaboration with IQMF, and International Human Rights Film Festival Nuremberg (IHRFFN). On this evening Stichting art.1 will launch their new project: Youth Artivist for Change, a project supported by the Ministry of Foreign Affairs of The Netherlands under the Creative Twinning subsidy scheme. Youth Artivist for Change focuses on empowering young filmmakers, storytellers, artists and activists in creating social awareness on Human Rights/LGBTQ rights and gender equality through the arts. The project takes place in the following countries of the Western Balkan: Albania, Kosovo, Serbia and Macedonia with film festivals such as The International Human Rights Film Festival Albania,PriFest Film Festival Kosovo and Skopje Film Festival as partners. Dr. Koen Slootmaeckers (lecturer in International Politics and co-Chair of the Council for European Studies’ gender and Sexuality Research Network University of London) will open the presentation with a talk on the current status of LGBT life in the Western Balkans. Chris Belloni and Antonij Karadzoski (Stichting art.1) will present the project. Tickets €5. Free if you visit any film during IQMF. Have you always wanted to connect with the IQMF Academy participants? Now is your chance, as this special screening showcases a diverse set of films by IQMF Academy participants. It is a unique opportunity to see short films by up-and-coming filmmakers, who are committed to queer and migrant topics. Curious what’s going on at IQMF Academy? Join our open masterclass in the Academy program for young creatives. Queer curators Raul Zambrano (IDFA), Esra Ozban (Kuirfest Istanbul) and Slava Doytcheva (Sofia Pride Festival) share their tricks of the trade for programming a (queer) festival. Join us at the bar afterwards. 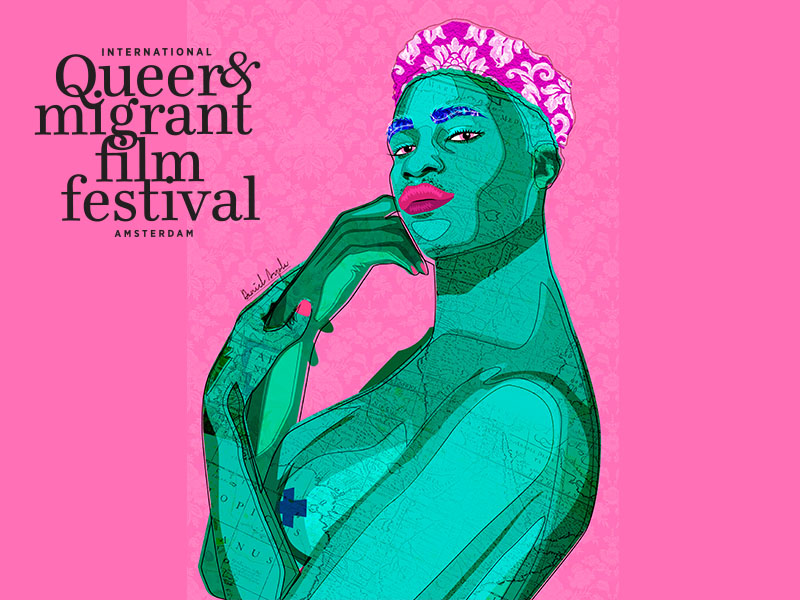 The opening party of the International Queer & Migrant Filmfestival will be hosted in the Vrankrijk by WTF Queers. While facing criminal charges, Pedro must grapple with his sister's sudden decision to move away and leave him behind. Alone in the darkness of his bedroom, he dances covered in neon paint, while thousands of strangers watch him via the webcam. How does a LGBTIQ refugee rebuild a life in the Netherlands? During this dinner these new Dutch residents share a table with their fellow countrymen. The evening focuses on connection and exchanging experiences followed by a screening of two films. In collaboration with DS, Subbacultcha and the Canadian Embassy. IQMF 2017 in Amsterdam will conclude with a very special programme on the Sunday afternoon. A programme in the dark, where you can close your eyes and just listen. Eight courageous people who fled their homelands and left their family in search for freedom, acceptance and love will present their stories in a mix of live storytelling and recorded audio. Queer Faces, Migrant Voices is a Stichting art.1 production in collaboration with IQMF, One World Festival Berlin & KIJUFI. Participants from the Netherlands and from Germany followed workshops in storytelling and radio making. The project is financed by Fonds voor Cultuurparticipatie, BJA-COW, Jonge Kunst - Fonds Soziokultur, Projektfonds kulturelle Bildung. IQMF has invited Secret Garden to join the panel LGBTIQ refugees: different realities, to address the issues LGBTIQ refugees face after fleeing to the Netherlands. The panellists will discuss exclusion, intimidation and abuse, a lot of which is experienced during the asylum seeking processes in Dutch refugee camps, where LGBTIQ refugees are humiliated and bullied by other refugees and often fail to obtain the protection they seek from Dutch authorities. In addition the panel will discuss how they are perceived by Dutch society in general and the LGBTIQ community in specific. With screenings of films The Crossing and House, Tree, Animal. The Crossing presents video portraits of eleven LGBTIQ refugees who speak about their experiences before, during and after the exodus from their homelands to the Netherlands. Their touching accounts demonstrate the challenges of living amid homophobia and transphobia. Dannie and Ferry have everything they could dream off, but still there's something missing. Keeping up with the latest trend, they take a trip to Greece to extend the family. But is this what they wanted? Massimadi Festival is a film festival from Brussels, which focuses on Africa and her diasporas. During IQMF the festival will screen two films. Prior to the screening Marthe Djilo Kamga, the founder of Massimadi Festival, introduces the program. A short documentary on the politically motivated media storm and homophobia that led to the cancellation of the first edition of the Massimadi Festival in Port-au-Prince organized by the Haitian Association Kouraj in September 2016. Lasseindra Ninja and Stéphane Mizrahi are two French pioneers of Voguing, a dance created in the 1970s within the gay community of Harlem, NYC. Their mission is to transmit this part of queer culture to the youth of the French suburbs by teaching their "children" to dance, to be elegant, but also to be proud. 1. combine (one thing) with another to form a whole. 2. bring into equal participation in a social group or institution. (a place that gives) protection or shelter from danger, trouble, unhappiness. A chance meeting in a park in Berlin proves to be fortuitous for two strangers, faced with uncertainty of their immigrant status and scraping circumstances. Asylum Park is a story about those who are the marginalised in society. A story about choices and courage and what lies beneath our perception of colour, immigration and sexual orientation. More films featured in this screening will be introduced shortly. TranScreen Film Festival is a multi-day film festival in Amsterdam with international films on trans* and gender diverse narratives. At IQMF, TranScreen presents the film Upon the Shadow. In 2013, Amina Sboui, who was 18 at the time, posted a photo of herself on Facebook, bare-chested with the text ‘My body is mine and not the source of other people’s honour.’ written on her chest. This was the first FEMEN protest in Tunisia. Her following arrest caused a worldwide array of protests, which resulted in her release. Three years later we visit Amina in the house that she shares with a group of LGBT friends. Rejection by family and society, and the pain that accompany this, form a constant thread running through their lives. How does an LGBT-refugee rebuild a life in the Netherlands? During this dinner these new Dutch residents share a table with their fellow countrymen. The evening is focused on connection and exchanging experiences. In between the courses there are talks of LGBT refugees, a lawyer, a representative of Secret Garden. The program will be moderated by Rohit Vyas. After dinner we will move to the main room for a screening of ABU by Arshad Khan. New Dutch residents: free. Please apply with lara@iqmf.nl. Other guests pay €27,50, this includes a two course dinner and a ticket for the film. The programme is a collaboration of IQMF and Secret Garden. - Sabine Jansen is legal researcher. She co-authored the research report "Fleeing Homophobia, asylum claims related to sexual orientation and gender identity in Europe" (Jansen & Spijkerboer, COC Netherlands/VU University Amsterdam, 2011). On behalf of COC Netherlands she currently carries out a research on Dutch practice regarding LGBTI asylum applications. - Emir Bellatoui is founder and chair of Stichting Secret Garden. Secret Garden is a Foundation of and for LGBT’s (Lesbian/Gay/Bi-sexual and Transgender) with an ethnic-cultural background, and sympathizers based in Amsterdam. The group with a Muslim background forms a large part of our target group. Its task is to represent the interests of its target group in the broadest sense of the word.